Graduate in Law from the Universitat Oberta de Catalunya (UOC) and holder of a master’s degree in Economic History from the University of Barcelona (UB). He is on the doctoral programme in Economic History at the University of Barcelona and is currently preparing his doctoral thesis. He extended his training in public policies for economic development on an executive course at the Harvard Kennedy School of Government. 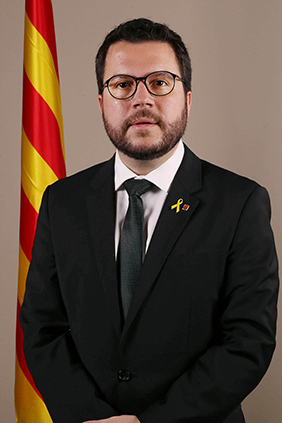 Secretary for the Economy in the Government of Catalonia from January 2016, he was a member of the Parliament of Catalonia from 2006 to 2016, where he had various responsibilities, including deputy spokesperson for the parliamentary group and spokesperson for the Economic Commission. He was councillor for Pineda de Mar Town Council from 2011 to 2018. He has been a member of ERC since 2000 and of Joventuts d'Esquerra Republicana (JERC) since 1998, of which he was national spokesperson from 2003 to 2007. Member of the National Executive of ERC from 2003 to 2010 and from 2015 to the present, he has acted as Secretary for Economic Policy and Knowledge and is currently deputy to the President for Institutional Relations. He has worked in a law firm specialized in advising companies and government agencies and collaborated as a lecturer at the University of Perpignan.